This is a bit of a variation on the style of plays I usually write for children. There is nothing very silly about this classic fairy tale...this cautionary fairy tale, if you will...about two innocent little children who are treated badly by their mean Aunt, and who are cast off into the woods to fend for themselves as their unsuspecting, loving father searches for them. Yes, there are some laughs as a pair of oafish woodsman cross the paths of the children and their Dad, but this is mainly a suspense story, full of intrigue and nail-biting tension as Hansel tries bravely to find a way out of the forest and does everything in his power to save his little sister. 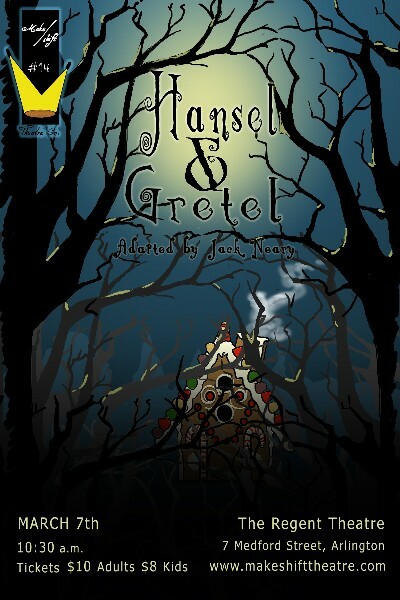 Their biggest obstacle, of course, is the Wicked Witch called Granny who lives in the alluring gingerbread house, and whose sweet and pleasant demeanor fools everybody but Hansel as he tricks her into turning the tables on herself. This is an absorbing, exciting rendition of this story.